My wife recently surprised me with a crop of candy bars to test out. She even sent me a picture to taunt me about all the tastiness I was missing out because I was at work. 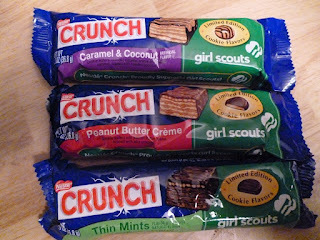 However, I apparently did not catch that these were, in fact Girl Scout Themed candy bars. So imagine my happiness when I realized that these were much, much different than the standard variation of taste most candy bars get. 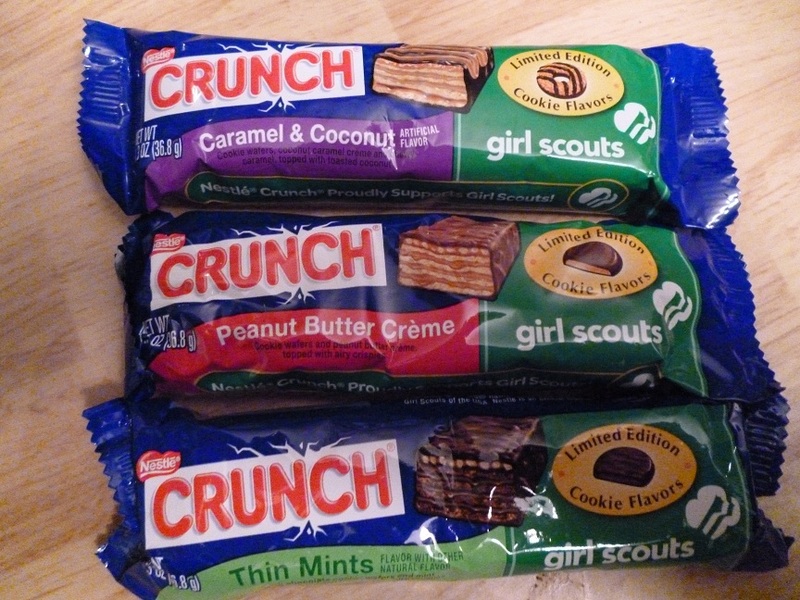 Even though these are Nestle Crunch bars, you can see from the packaging above they are more like those sugar-wafer bars you often see. There are several thin layers of wafer in each candy bar and there doesn't appear to be any crispy rice involved. That's not necessarily a bad thing, as we shall see, but don't go in expecting a standard Crunch bar. As us sophisticated candy bar reviewers know, selling a new candy bar often means using a well-known name despite having roughly zero in common with the original version. The candy bars above actually are two small candy bars apiece. I'm sure there's some merit badge you can earn by sharing each of these snacks, but I recommend not doing that, especially if you are not a Girl Scout. Just eat it. First up is Samoa caramel and coconut. It doesn't quite taste like the cookie; rather than being chewy, it's crispy (hence, the "Crunch," I suppose). Both the coconut and the caramel flavoring are light, but since they have a tendency to be strong this is probably a good thing. They seem to have hit the right balance in flavoring. The next is the Tagalong peanut butter creme bar. It tastes very similar to a Nutty Bar, with perhaps a little bit less wafer and more chocolate and peanut butter. This is a good thing, of course, since Nutty Bars can be gross if you eat them on the wrong day. (Don't ask.) By itself this is a good candy bar, but I'm afraid it may not differentiate itself enough from similar candy to be notable. Finally, the Thin Mint is exactly how you think it would taste. It's probably a little stronger than it should be; my wife thought it almost tasted like medicine or a cough drop. From a consistency standpoint this was most like the cookie, but I think I'd rather just eat the cookie. That said, it's not a bad candy bar by any means. Oddly, it's the consistency of the candy bars that sets them apart from the cookies, and that is their advantage. Don't buy these candy bars assuming they are just going to be the cookies in candy bar form; you'll be disappointed. However, they are similar enough that they will probably sate the same craving and they are unmistakably based on those popular cookies. As long as you like your Samoas, Thin Mints, and Tagalongs, you'll like these--and even if you don't, these are different enough to warrant a try. We spent a week looking for these. Just this Monday we finally got the Samoa version. My wife hates coconut, so there was more for me. It was a win-win (meaning I won twice).